“Members of the Association have been greatly concerned at the effect of upon Resorts of the broadcasts which are made of the meteorological forecasts, as in many instances the forecasts have affected the visits to their towns by prospective holidaymakers”. “The Government should be urged to introduce legislation to compel the registration of hotels and boarding houses and other tourism accommodation”. ” Extension of summer time. ……..help in persuading Government to start Summer Time before Easter so that those people who would like to take holidays them might be encouraged to do so” . These are a just sample of around a dozen industry issues that currently in play that were being actively discussed at our AGM and annual conference but the one in 1959 and not our most recent event. Clearly progress in tourism can be slow! 2. 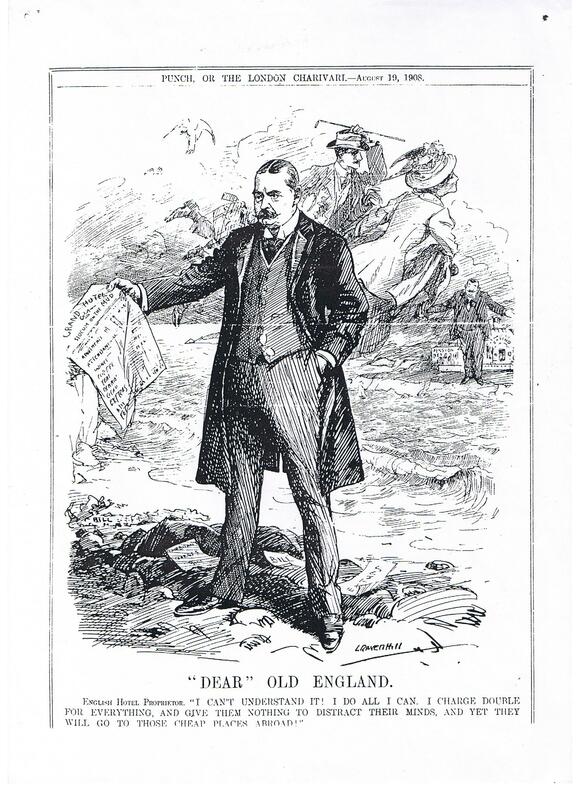 “Holiday in Britain Campaign …..Delegates discussed the proposal with Mr Bridges, and views were expressed both approving the scheme in principle and disapproving it; the expression of approval being based on a realisation of the inability of the of individual resorts to compete with Continental advertising, and on the fact that the scheme would “step-up” methods for advertising Home holidays especially among the 11 million people who do not take holidays away from their homes: while the expression of disapproval were based on the question of finance (i.e. many resorts would find it difficult to afford £200 out of their limited advertising funds; it is a National problem and the cost of the advertising should be a National charge – the B.T.H.A. [British Travel and Holiday Association] should, in addition, to undertake the administration of the scheme, give a lead financially) and also the individual resorts would secure better results from their own advertisements in their own selected papers”. Sounds vaguely familiar? Association of Health and Pleasure Resorts summer conference 28/29 June 1955. B.T.H.A. was in essence the “private sector”, forerunner of the national tourist board(s,), still to be created by the as yet far distant 1969 Development of Tourism Act. 3. We at British Destinations hold the records of our predecessor organisations going back to March 1955, unfortunately the records between 1921, when the organisation was first formed, and 1955 have been lost. The intention is to post the occasional “blast from the past” to help remind us all that very little in this complex industry is every totally new. Whether these snippets helps or hinder our understanding and our ability to make progress remains to be seen……. 4. So what was exercising the minds of the industry and informed commentators in the summer of 1908? Surely not competitiveness, quality, ancillary activities , cheap overseas competition and the like? The language has changed, for example in 1908 for English read British but the essence of what’s being communicated might also seem strangely familiar 5. The following passages in J.A.R. Pillott’s “The Englishman’s Holiday.” Published in 1947 by Faber and Faber; reproduced 30 years later by Harvester Press in 1976 seem to be as remarkably perceptive now a further 40 years on as it probably was when written in 1946/7, presumably based on evidence drawn mostly before the enforced break of the 1939-45 war. (Modern interpretations added in brackets). “Each side in this curious partnership (private and public sector) is essential to the other but only the public authority can effectively co-ordinate the many strands which compose it….The role of the municipality has steadily enlarged…. Experience has shown how easily decline can set in where it (the municipality) is careless or neglectful.” page 245. There are a number of useful reminders here for those considering the need for destination management (of which marketing is only one, albeit important part) and whether there is a need for strong local public sector engagement, in whatever one of many modern formats that destination management now may take. 6. And finally a particular favourite of mine: “Revolving Summer Houses…….it appears inequitable that the Whitley Bay Council should be compelled to refrain from replacing this amenity for the use of their visitors and residents and forgo the revenue which would be derived, because the Military Authorities who took the chalets compulsorily cannot now find them, and the Purchase Tax makes purchase of new ones an uneconomical proposition”. Minutes of the Executive Committee 16 March 1955. A full ten years after the end of the second world war and physical and fiscal impacts were still being keenly felt and all we now have to worry about is things likes of VAT on tourism services and the ongoing effects of a recession!